Lets talk about joomla template, with his help you can create a small online store, as well as a large resource of the whole supermarket, the Internet allows you to trade all over the world and your store becomes a world market. Its universal structure and adaptive layout will allow you to fill its pages with diverse content. Text and graphic information in SmartAddons PiStore has an equal percentage. A large number of various active links will help push the user to active actions. This template can also be used to create an online resource on which services promoted in various areas of human activity would be promoted. At the top of the template are the most requested buttons for entering, registering, switching languages and displaying the type of the current currency for financial transactions. You can connect friend web site on yours and you do to market to market change. It has a large search form, with a built-in drop-down list, to delimit the search for individual categories. This Joomla template has a very capacious and informative main menu. There are many sections and subsections that allow you to quickly access to a particular category. The SJ PiStore template has a large number of built-in sliders that allow you to place a large amount of visual information in a limited space. SmartAddons templates are universal products that allow solving tasks of various nature. They are initially focused on fulfilling the functions of online resources that allow the seller to interact productively with the buyer. They have many built-in useful features. These templates have almost no flaws, since a large number of professional designers and web developers work on each of them. Most of us do not have the proper experience to develop a quality website, and it is not always possible to seek help from specialists, since the price for their services can be quite high. But, despite this, you can get an attractive website without any help by making it yourself. To do this, you need the OS Sport Store and a few minutes left. The template contains all the necessary functions for an online store. First of all, it will be interesting for shops specializing in the sale of sportswear, dietary supplements and sports equipment. Also, no one bothers you to use OrdaSoft Sports Store for the implementation of other types of goods. In addition, there is an opportunity to create a portfolio and publish news on the blog. Design is an important part of any project in the network, so a flexible system of settings was added to the Joomla template to edit the look of the site. Here are a few of the options available to the administrator: a color editor, a large selection of fonts, logo installation, sidebar layout, background image, social buttons, etc. When you create a catalog with a product, a special filter appears in it that allows you to sort objects by their main characteristics. The buyer can choose a category, brand, price and add the purchase to the basket. All important information on the product, as well as their photos are on a separate page, where anyone can leave a comment. In addition, the template OS Sport Store offers a large number of additional modules. Here you will find: an animated slider, a new and popular product, advertising banners, news from a blog, a subscription, customer reviews, partners and much more. Know what's the stock market doing today? And use this template for any type of trend product. Why waste time developing a website when OS Sport Store templates allow you to get it right now. Installation takes a few minutes, and the finished result will pleasantly surprise you. The layout, designed for use in online stores and websites of restaurant chains, boasts a fairly user-friendly interface and attractive visual design that will positively affect the perception of the page. Spice Shop Responsive VirtueMart Template will work well with the official web resources of various catering establishments, give customers the opportunity to get acquainted with their services and products in a convenient way. Creating a Spice Shop Responsive VirtueMart Template, the development team made a choice in the direction of the classical structure of the site with a simple and colorful design, perfect for a page of a public institution or a grocery store chain. The main section of the resource will acquaint the visitor with the most important sides of the web resource through graphic slides, blogs and other inserts of the most relevant site content. 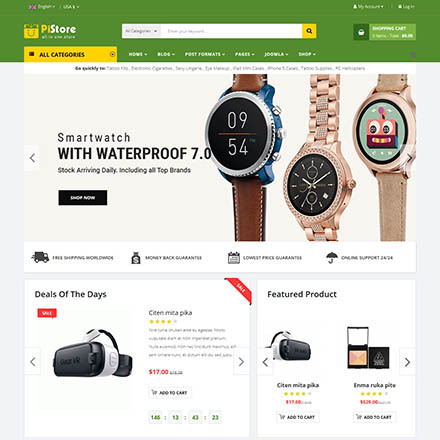 The functional of the store is presented in the form of a convenient page with cells for goods in which the placed product is supplemented with an image and a text description. Shopping cart also traditionally placed in the upper part of the site and provides an opportunity to view all customer purchases, as well as go to the page with payment options. In addition, the Spice VirtueMart Joomla Template will give your resource a user registration form, as well as the ability to select the localization of the page and the currency to display prices. Thanks to the TemplateMonster, thousands of users were able to translate their wildest dreams of personal pages on the Internet into reality without having to personally engage in a long process of debugging them. The web-studio continues to replenish the range of its products with more and more new and modern layouts for pages of various types. Vina Calaco template pays tribute to the classic design of the web resource, offering your website a serious and balanced style, in which the extensive functionality is intertwined with comfortable navigation and enticing appearance. The layout is filled with various settings that open up to the user a lot of possibilities for processing the structure and interface of their Internet project. The functionality of the template is aimed at its use in the field of electronic transaction systems, which will be an indispensable advantage when developing the site of your network market. VinaGecko Vina Calaco will perfectly cope with the challenges facing a developing enterprise in the industry of online sales of all categories of goods, including shopping, electronics and accessories. The start page of the Vina Calaco template contains everything that can interest a potential customer in case of intentional or accidental hit on the site of your webstore. The main greeting and face of the market is an animated slide, which, to consolidate the effect, should be filled with information about any promotion or a new exclusive product. The sale itself takes place through commodity cells, each of which has a specific product to be sold and detailed information about it, from a verbal description and photographs to technical and physical characteristics. 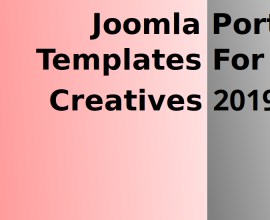 The interface of the Joomla template is distinguished by the monochromatic coloring of the main theme of the resource, while the additional panels and settings can be painted in a different shade. The menu bar is located in a horizontal position at the highest position of any page on the site, playing the role of a guide through its sections. In addition, another resource settings panel is installed above the main menu, give additional features to the guest page, including registration and login to the user account, the choice of localization of the store and the main currency of the site, in which the cost will be provided. VinaGecko quality templates remain an economical and fast solution to the many difficulties that arise when a user is working and debugging his website. Each product line has a unique design, capabilities and interface, which allows the studio to be rightfully considered to be a manufacturer of universal layouts. A simple and functional template Groesy is an optimized code, convenient “drag and drop” page builder, as well as many options for personalizing your site. He has a strict but stylish design that contains a large amount of information. Its interface is intuitive, which facilitates the movement of visitors through the pages of the site. A template layout has 100% adaptability, so it adapts to any screen. This template has many applications that are limited only by the setup time. In the standard layout, ThemeForest Groesy is perfect for business. 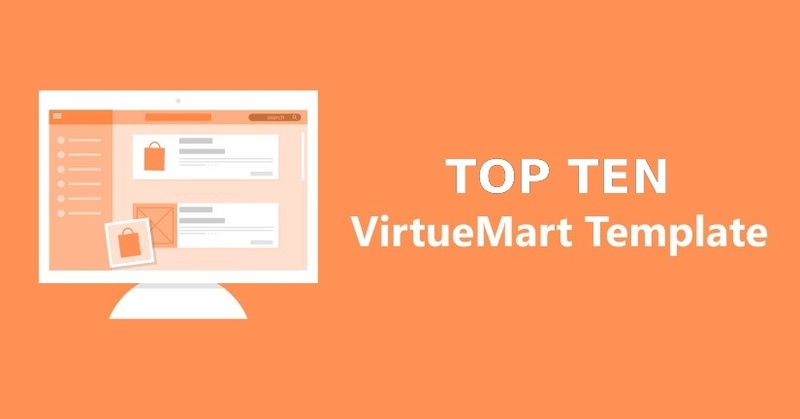 With it, you can promote almost any products or services, with help Virtuemart extension you can create online store. Moreover, e-commerce functions are already built into it, which allows trading directly from the site or creating a full-fledged online store. The design of the template is moderately saturated with bright colors, but at the same time clearly structured and strict. This allows visitors to evoke positive emotions while simultaneously directing them towards the business. This Joomla template is very rich in a variety of modern design solutions and impressive effects. It has as many as 6 home page options for business and 2 for online store. All of them are significantly different from each other, but have a common style. However, the TF Groesy template allows you to create your own, unique version of the main page by simply dragging and dropping the necessary blocks. In the same way, you can customize the online store page. ThemeForest templates can be seen on many active sites on the net. Their incredible popularity is easily explained by high quality and ease of management. In addition, their attractive design immediately attracts attention. When an urgent need to raise the company's website, the templates of this studio will be the best choice. Competition in the cosmetics market is extremely high, but with a good website and support for social networks, business can be much more successful. The Costrix AT template was created using modern design and a number of additional functions to help cosmetics companies to attract new customers and promote their products on the Internet. With stunning presentations and great images, this template gives visitors the opportunity to feel as if they are in a real cosmetics store. High-quality visual design and wide functionality of AGE Themes Costrix allow customers to better evaluate the available products, and therefore quickly decide on their purchase. In addition, the adaptability of the template allows access to the site from any device. The design of this template has a lot of high-quality images, seasoned with interesting animation effects, joomla admin panel, which makes the site more interactive. For example, such effects are present in the header of the site and in all product cards. This Joomla template has a flexible layout of the main page, which allows the owner to choose a full-screen display of the site or its version with a limited width. In addition, the choice also offers 4 color styles that can slightly diversify the design. The Costrix AT template comes with a built-in extension called Virtuemart, which provides convenient merchandise management, and also has full K2 support for enhanced blogging. AGE Themes templates have long been proven to be one of the best solutions for starting your own online business. 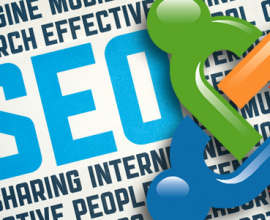 They significantly reduce the cost of launching the site, and also very effectively attract the target audience. They can be used both for creating large projects and for small sites. In addition, they always have high quality and amazing design. Every day more and more entrepreneurs want to see their own website on the Internet. And many of them believe that without the help of programmers to get a quality resource is simply impossible. However, this is not the case. Having a JSN Ferado 2 Template available, you will not have to pay for expensive specialist services. Just a little free time to install it, and you will see the finished result. The template has all the properties of a full-fledged online store and is perfect for selling clothes and accessories. But you can also use JoomlaShine Ferado 2 Template to sell other products, such as furniture or mobile devices. For ease of customization of appearance in the Joomla template were added two layouts for the main page, six styles of different colors and four types of menus. There are several options for the pages of contacts, description of the store, timer to the upcoming event. If you wish, you can edit the design using the parameters in the joomla admin part of the site. There you will find a color editor, a background setting, a logo, a variety of fonts, and much more. In addition, the JoomlaShine Ferado 2 VirtueMart Template boasts a solid set of modules. 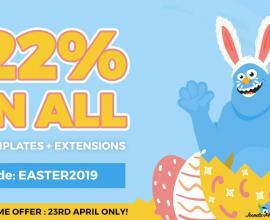 Here are some of them: seasonal collection of brands, statistics, advertising banners, videos, gallery, animated slide show, product categories, etc. There is also a built-in image gallery and a handy shopping basket. In addition, the blog supports posts of different formats, but the catalog with the product can be in the form of a list or grid, depending on what the visitor wishes to choose. When there are JoomlaShine templates, creating a site becomes an exciting activity that does not take a lot of personal time. All the work on installation and configuration you can do on your own, and upon their completion you will have a fully-ready high-quality website. The online store is a fairly profitable type of business, but how much needs to be done to ensure that the site with goods begins to not only function stably and look attractive, encouraging users to linger on the page and familiarize themselves with its contents. Template ZT Elise is ready to take on the solution of issues related to the design and performance of your future Internet project. All that is required of you is to use friendly tools that any user, even those who are not even familiar with the basics of web programming, can master and rework the web resource the way you want. The layout fits perfectly with an online store specializing in the sale of fashionable clothes, electronics, accessories or home appliances. ZooTemplate Elise will provide the user with variable settings for comfortable placement in the open spaces of the site not only links to the goods sold, but also many other elements useful for the electronic transaction system, such as order forms, etc. The owner of the online store can decorate the start page with a colorful animated slide, which is nicely complemented by a customizable graphic background. The cells and pages of the goods sold allow you to fill yourself with all the most necessary information about the object, including its description, price, images and characteristics. 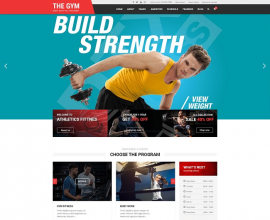 The main menu of the ZT Elise template is also customizable and acts as a site header, giving users the ability to quickly navigate between different product categories and store sections. In addition to the standard functionality necessary for the organization of the electronic market, there are tools for filling the page with additional content, such as blogs and news articles. 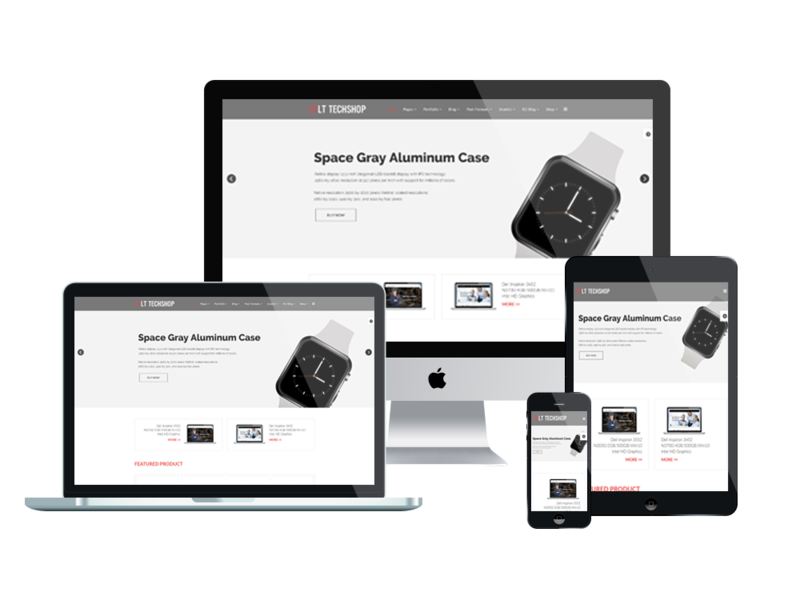 The Joomla template is equally functional both on PC monitors and on displays of smartphones and tablets, which will allow customers to use the services of your store even without access to fixed devices. There are many different studios developing in the direction of web design, but ZooTemplate templates take their creators to a new level, each time proving their professionalism and responsible approach to their work. There is no doubt that the Internet is extremely popular. Each of us at least once a day comes into the network from different devices. The global web has long been interested in entrepreneurs as a platform for doing business, and the creation of a website today does not cause problems for a person even far from programming. If you want to do business in the network, then the LT Tech Shop Template is ideal for this. 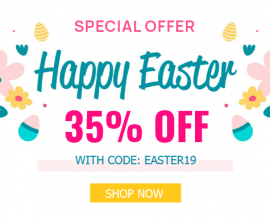 It will help you quickly and easily create a full-fledged online store, on the pages of which you can sell absolutely any kind of goods. However, Tech Shop is best suited for selling mobile devices and their accessories, as well as home appliances and electronics. But if desired, it can be clothes with perfumes. The Joomla template includes a flexible system of settings for editing the appearance of the site, it includes: choosing a color, changing the logo and font, setting the background image and much more. But if you wish, there are ready-made solutions for quick customization: six color styles, three main page layouts. When forming the main page, you have at your disposal forty positions for various modules. These modules may include: the latest and recommended materials on the site, slide shows, banner ads and other information in the form of animated carousels. The LT Tech Shop template contains two main menus, one of which is intended for navigating through the product catalog. By the way, the directory itself can be in the form of a list or blocks. Also, visitors have the opportunity to pay for the purchase in any way through the basket. And on the product pages they can easily find everything they need: a description, rating, scaled image of the product, reviews, etc. Open a resource in a few steps without much effort can afford only the templates VirtuemartTemplates. They have a simple and intuitive interface, a lot of settings for editing the appearance and a large number of modules to fulfill any of your desires. If you want to launch a startup in high society, you need to get the highest quality blanks. The garb fashion store Joomla template is just one of those high-grade blanks that can be used to create something sublime and inaccessible. The best developers and designers have put a lot of effort into creating this elite product. It is all the highest quality and in the best quality. Such a template should definitely flaunt on the sites of fashion show. It should fascinate a huge number of users. Garb fashion store Joomla template was created with the expectation that it will be used not only as a working tool, but also as a reference product. This template sets the fashion and dictates the rules by which all analogues must be created. It can successfully use the elite stores engaged in sales of expensive, delusional products. It can be taken as the basis for creating elite workshops engaged in, for example, tailoring clothes or suits for individual orders. This template has a great visual slider. It is possible to place graphic material in high resolution. And this will not affect its speed. The Joomla template is based on innovative and optimized software code that allows you to quickly generate pages and not slow down while interacting with its controls and navigation. Contrasting dark and light colors of the blocks that make up the template, advantageously distinguish it from the masses of developments of this kind. Garb Fashion Store template is not crowded with modern gadgets, but at the same time it looks and is perceived as relevant or even ahead of its time product. 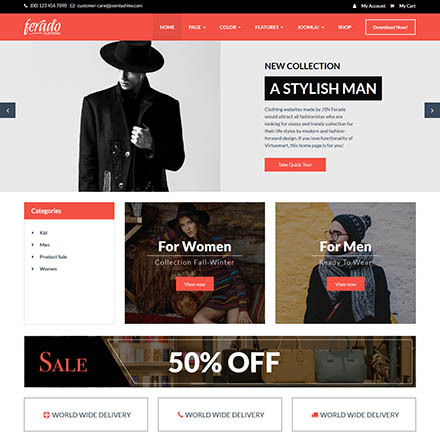 Garb fashion store Joomla template are created to impress. Their appearance is always pleasing to the eye. They attract views. Having tried a series of this product, you no longer want to work with other analogues.